A rather lovely thing about running a blog is that people from all over the place get in touch out of the blue to tell you about projects they're working on. And we reckon we've been pretty lucky so far, as nearly all the stuff that's been sent our way has been dead interesting. 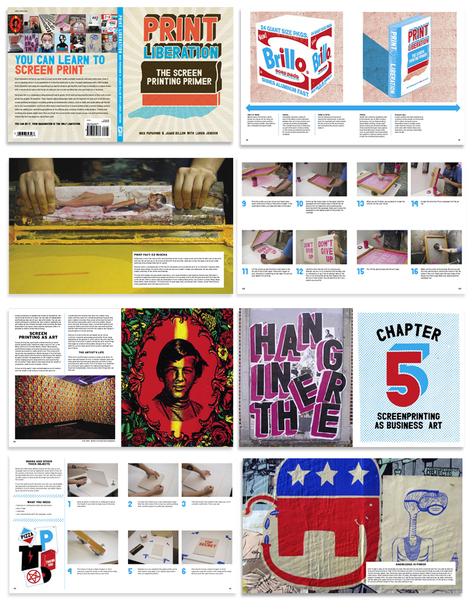 One such project is the new book coming up from the Print Liberation studio in Philadelphia. It's a primer on how to start screen printing using really basic elements, and is written by Nick Paparone & Jamie Dillon from the studio, in collaboration with Luren Jenison, with illustrations by Tim Gough. It looks fantastic - we can't wait to get our hands on a copy. Print Liberation is published on July 25, by F+W Publications, the kids behind How, ID and Print magazines.